When it comes to patisserie choux is always impressive it's not too delicate or fussy to make either. Éclairs were already on the menu this month when I spotted they were the theme for this months Blue Kitchen Bakes Classic French challenge which is hosted by Maison Cupcakes. I'm using simple cream and dark chocolate with these éclairs and I stuck with my tried and tested recipe from Delia. I took a look at the Larousse Gastronomique recipe and found that it has the addition of salt and milk and uses more butter in the choux. I imagine this gives a richer dough but you won't find that these éclairs are lacking at all, I've never had any leftovers when I've serve them. Bring the butter and hot water to the boil. Sieve the flour and sugar together then add them to the water and butter. Beat the mixture over the heat to cook out the flour, this takes around a minute and a thick ball of dough will form. Beat the eggs together before slowly adding them to the cooled dough. Beat a little egg into the dough before thoroughly combined before adding more. 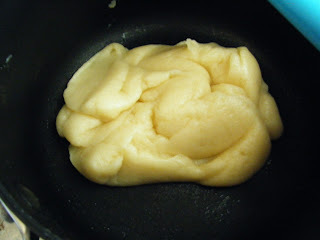 I mentioned when I made choux buns that the only times I've had any problems with choux is when not adding the eggs slowly enough, if you add them too quickly I've found that it drowns the batter. Also, let the dough cool for 5 minutes before beginning to add the eggs, you don't want the heat of the dough to scramble them. Pipe the dough into fingers on a tray lined with baking parchment. 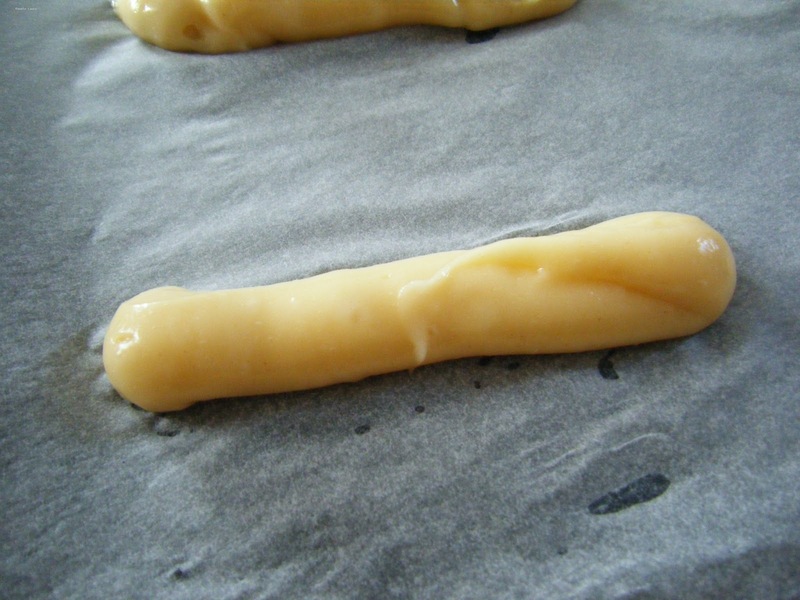 Be mindful that choux spreads and grows, your éclairs might look skinny when piped out but they are going to fatten up in the oven and if you pipe too much dough you run the risk of the centre not cooking. 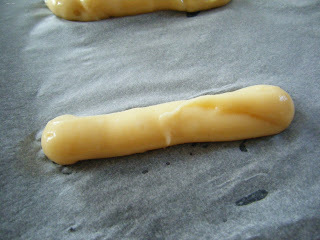 You can chose to inject the cream into the choux fingers or partially slice them and pipe the cream in. I wasn't too sure if "Classic French" éclairs should be injected with filling or if it was allowed to cut them and pipe the filling in. 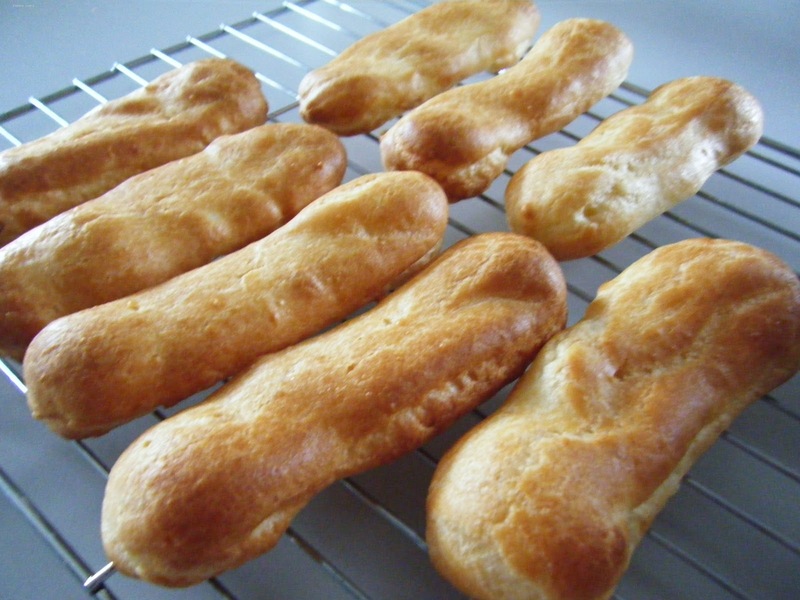 A quick search came up with photographs for both, as I don't have a long syringe like nozzle I went for the easier option and sliced a horizontal cut two thirds of the way into the choux fingers. Cut the éclairs while they are still warm as this allows more steam to escape from the centre, if you are injecting the cream into the éclairs poke a little hole to allow the steam to escape from the choux finger. If the steam cannot escape the pastry may become soggy inside. 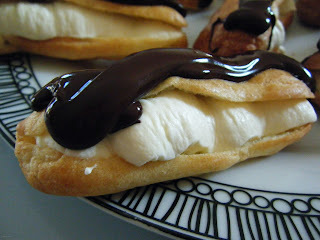 Leave the éclairs to cool completely on a wire baking tray before adding the cream and chocolate. 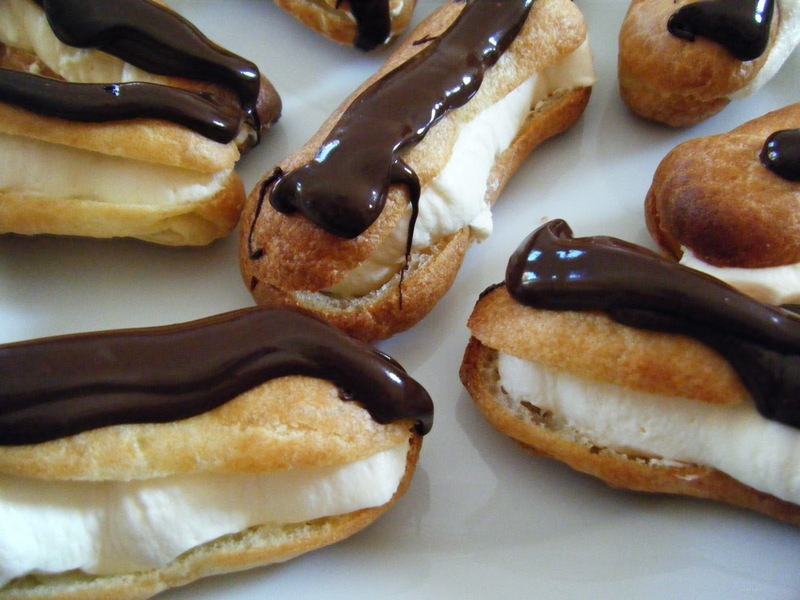 Pipe double cream whipped to soft peaks with a teaspoon of icing sugar into the slits you made earlier. It's best to add the cream close to when the time that you are due to serve the éclairs. If left sitting with cream in for more than a few hours the pastry looses some of it's crispness to the moisture from the cream. Melt dark chocolate in the microwave and pipe it over the top of the fingers. Allow the chocolate to cool until it is at least tacky before serving, this is purely because they are very messy to eat if you don't. 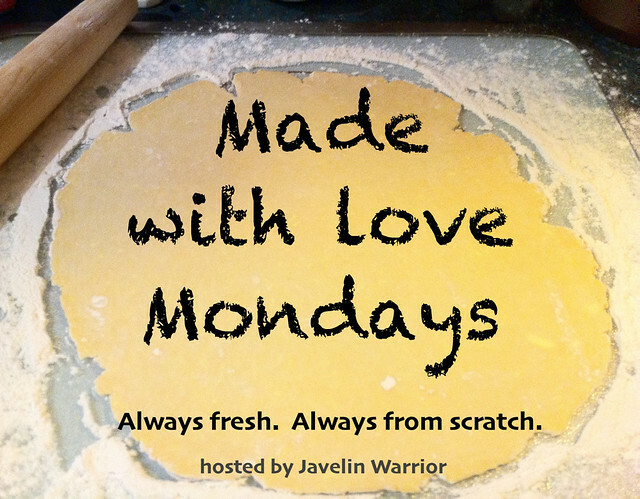 I'm entering this recipe into both Classic French and Made with Love Monday link up.